Following on from a story of sporting success for Killusty National School in 2018, 2019 is shaping up to tell a similar story - a story of how commitment and dedication finds its just rewards. Matching the achievements of last year would be no easy feat. In 2018 our U13 county hurling finalists played bravely in Semple Stadium, our mixed Athletics team secured second place in the South Tipperary Track and Field event and our individual gold medallist, Oisín Ryan, ran impressively at the Tipperary Cross Country supported by a very strong Killusty athletic squad. All these sporting achievements of 2018 paved the way forward and left us with an inspiring act to follow in 2019. And the children of Killusty School certainly rose to the challenge. After months of dedicated after-school training in Spike Ball, our mixed and boys’ teams played their regional qualifier in the Watershed, Kilkenny on January 28. Our boys’ team put up a spirited display winning all their group matches convincingly, finishing with first place in the group stages. They narrowly lost out on qualifying for the All-Ireland, after a tremendous performance in their knock-out Final. The mixed team also finished top of their group on the day and secured their well-deserved place in the All-Ireland competitions, after an enthralling knock-out match. All roads led to UL for the All-Ireland competition where the top sixteen teams in the country battled it out for national honours. Placed in Pool A, our mixed team won two out of their three group games against the Cork and Galway regional winners and were pitched against defending champions for their Knock-Out match. After putting up a fantastic performance victory finally eluded us. Although triumph was not ours on the day, Children in Killusty School made history by becoming the first Spike Ball team to participate in the All-Ireland Spike Ball Finals. Killusty School boys’ soccer team that qualified from the South Tipperary FAI competition in Cahir Park on February 27. 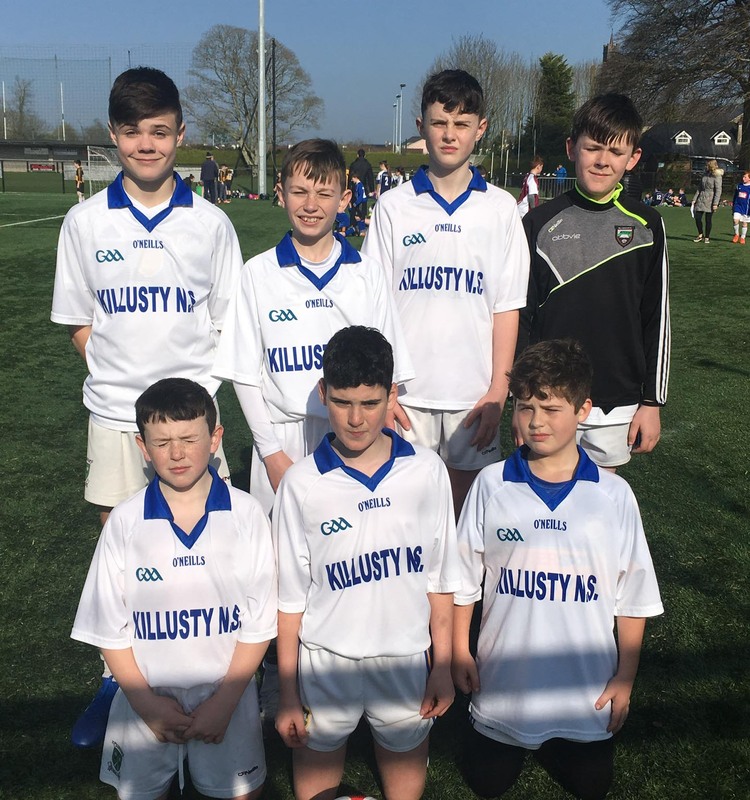 On the soccer front, Killusty School enjoyed a similar success story whereby our boys’ soccer team qualified from the South Tipperary FAI competition in Cahir Park on February 27. The boys acquitted themselves well by finishing top of their group and securing a place in the Blitz final against Knockavilla National School. Finishing 1-1 after full time, an exciting penalty shootout would decide the winners. Both teams stepped up to the mark and after 5 penalties it remained tied. Sudden death would declare the winners – not for the faint hearted. Killusty players maintained mature composure to emerge victorious. Our place is now firmly booked in the County Finals in May. Spurred on by the boys’ success, our girls’ soccer team travelled to Cahir to compete in the south Tipperary FAI competition on March 6. The girls put in a battling performance to win two out of their three games, finishing second in their group. Alas this result ended their soccer journey for 2019. Success also came our way in Community Games competitions in March this year whereby fantastic art and hand writing entries were submitted, resulting in many medals making their way to Killusty NS. Following on from Parish success, three of our pupils would enjoy further glory in the County Finals in Thurles on March 9. Joe Purcell and Inés Byrne were crowned county Under 10, Handwriting Champions while Freya Byrne was a silver medallist in the under 14 Art competition. Going forward in 2019, we remain committed in our participation and look forward with optimism to maintaining the hard- working Spirit of our Country School.